This cake is for marzipan lovers. Dust it lightly with vanilla powdered sugar and serve it with sliced peaches or nectarines and crème anglaise. It's delicious with either a cup of coffee or tea, or a glass of sherry or an Italian Aleatico or Passit. Beat the sugar with the almond paste until the almond paste is in fine pieces. Or, better, pulverize it in a food processor. Beat in the butter and the vanilla, then cream the mixture until it is light and fluffy. Beat in the whole eggs, one at a time — the eggs should be at room temperature — beating well after each addition so the eggs are thoroughly mixed in. Mix the flour, baking powder, and salt, and beat in just until thoroughly blended. Butter and flour a 9-inch springform pan and turn the batter into it, smoothing the top evenly. 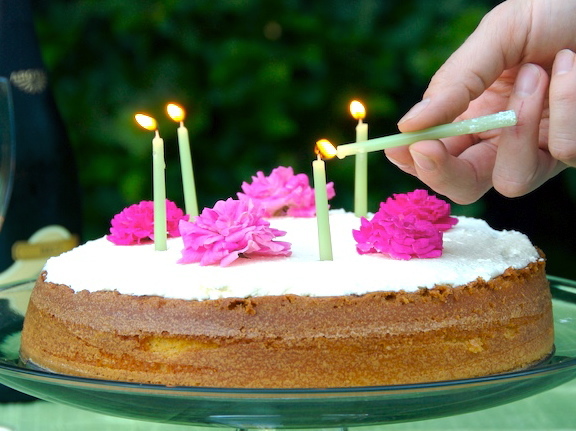 Bake in a preheated 325-degree oven for 1 to 1¼ hours or until a toothpick inserted in the center comes out clean and the center feels springy when you push it gently. Culinate editor's notes: David Lebovitz, who used to work with Lindsey Shere, has his own, slightly lighter version of this cake on his blog. If you want to turn this cake into cupcakes, use cupcake liners in two muffin trays and bake the cupcakes for about 22 to 24 minutes. A few blackberries dropped into each cupcake before baking makes for a nice, jammy surprise at the bottom of each cake.